ADDRESS: 2020 Gardenbrook Lane, Tallahassee, FL 32301. Off Victory Garden between Park Ave. and Apalachee Parkway. Bus lines nearby on Park and Victory Garden Drive. Eastside. APPLICATION: Written Application. for Rental History, Employment & Income, Credit Report, etc. $50.00 (Cash or Money Order) Application Fee per Person or per Married Couple.Application fee is Non-Refundable. 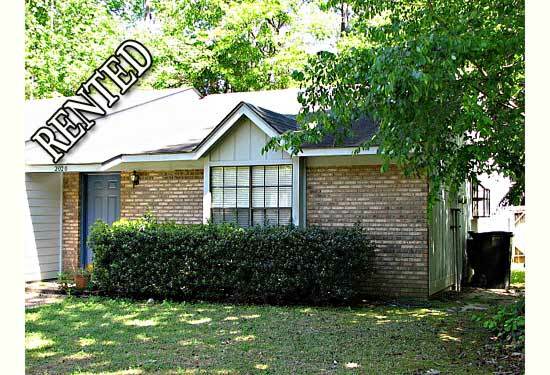 UTILITIES: Tenant pays for all Utilities: City of Tallahassee, Cable, telephone, internet etc. Owner or Property Manager changes Air Conditioning Filters Monthly. LIVING AREA SIZE & ROOMS: Living Room has a Brick Corner Fireplace, Vaulted Ceiling. Living/Dining Comb (L-shaped) open to the Kitchen with a Bar. About 1000 Sq. Ft. KITCHEN APPLIANCES: Range, Refrigerator, Dishwasher and Microwave. NO SMOKING: No Smoking, Inside or Outside. This is a smoke free environment. AMENITIES: Fenced Backyard, Raised Deck, Screened Porch. Newer interior paint and newer carpeting. Tile Floors in Living/Dining Rooms, Kitchen, Laundry. Hallway & Two Bathrooms. Newer Carpet in the Two Bedrooms. Ceiling Fans. In Excellent Condition. Close to Koger, Governor’s Mall and Downtown.